Celebrate this holiday by indulging in delicious bacon treats. This is one of the tastiest holidays you can celebrate. There’s nothing in this world that doesn’t taste better with bacon. Whether it’s a classic BLT sandwich, chocolate-covered bacon, bacon cheeseburgers, bacon-wrapped scallops or even bacon chocolate chip cookies, you can’t deny that it’s a delicious treat that’s truly gotten it’s greasy fingers in everywhere. This is easily one of the tastiest holidays you can celebrate. But how, exactly, does one celebrate Bacon Day? The best way of commemorating this dedication to swine and satisfy your craving is by indulging in the delicious bacon treats, of course. 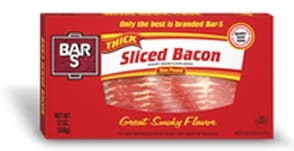 Wake up to a bacon-featured breakfast with Bar-S Foods, the largest packaged meat company by volume in North America. What smells better than the aroma of hickory-smoked bacon sizzling in a hot skillet. Don’t have a whole lot of time to spend in the kitchen? No sweat…Bar S has you covered. Get to the good stuff even quicker with the convenience of ready-to-eat, fully cooked bacon slices with a great smoky flavor. Be sure to check out some of Bar-S Foods’ favorite bacon recipes. You can start by going to an all you can eat breakfast place that has bacon on the menu, trust us, they exist! Stop by the Blue Hound Kitchen at Hotel Palomar in downtown Phoenix for their unique twist on the classic BLT. With fried green tomatoes, gem lettuce, avocado mayo and smoked bacon on cibatta, this should really hit the spot. 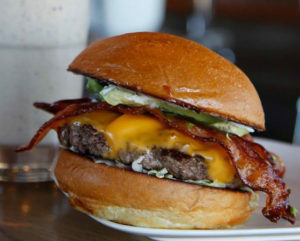 With a name like Zinburger, you know it’s got to be good. Their Ringer burger is sure to please with applewood smoked bacon, Frank’s Red Hot, onion rings, pepper jack cheese, lettuce and mayo. If all this talk about food is making you thirsty, fear not. The bacon bloody mary at Culinary Dropout will quench your thirst. Experience the Wild West and visit Rawhide in Chandler, the town that promises to deliver up a true western encounter. With plenty of unique menu options at its steakhouse, don’t miss their delectable bacon-wrapped meatloaf. If you have a sweet tooth, head over to Fractured Prune Doughnuts where you can choose from 19 glazes and over a dozen of toppings, including crumbled bacon. So get out there and celebrate Bacon Day on Dec. 30 and have a delicious new year!